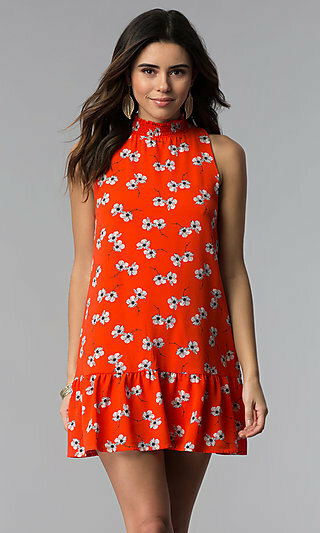 Wear one of these sunny orange dresses, and all eyes will be on you as you make your entrance to any special event. Simply Dresses has orange party dresses and orange formal gowns in different shades and styles. There are short orange cocktail dresses, orange formal dresses, long dresses in orange, and short cocktail dresses in various shades of orange, including tangerine, sunset orange, peach, and cantaloupe. 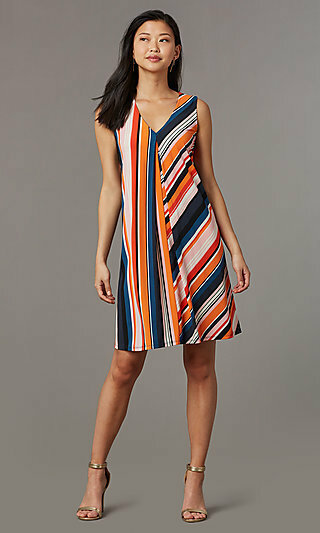 Long or short, print or solid, if you're looking to be noticed, a gorgeous orange dress will do the trick. Why Wear a Short Orange Dress or Orange Formal Dress? Short orange dresses and orange formal dresses provide a unique and exciting vibe. Choosing a short orange cocktail dress or long evening gown in orange shows that you are energetic, vivacious, and often the life of the party. If you love to brighten up a room, then an orange party dress or long orange formal dress is the look for you. Highlight your outgoing side when you attend your next family picnic sporting a trendy mini dress in neon coral or a high-low orange party dress with a bold floral print. Orange dresses are energizing, vibrant, and sometimes even flamboyant, so short orange cocktail dresses and slinky orange club dresses are great for nights out with friends at your favorite nightclub. For a romantic date night look, choose a soft tangerine orange a-line party dress or a short peach lace dress. The color of orange is associated with warmth, joy, sunshine, and the tropics, so make sure your wardrobe is ready with at least one short orange cruise dress or long evening gown in orange for your next tropical vacation or destination beach wedding. 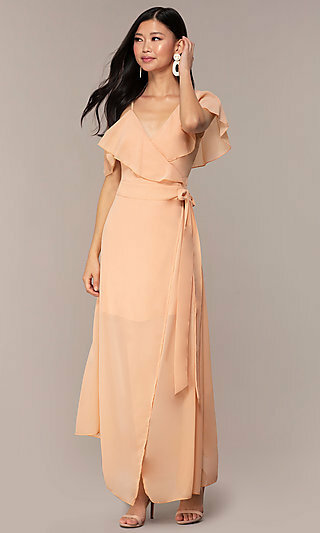 There are short orange wedding-guest dresses that vary from semi-formal short orange dresses with deep v-necklines to beaded long formal evening gowns in orange.Whatever your event, you are sure to make an impression and warm up the room in a party dress or formal gown in a fiery orange color. Whether you're in search of a casual floral-print orange party dress, an orange cocktail dress, or a long orange formal gown in lace and tulle, this collection of orange women’s formal dresses and orange party dresses from Simply Dresses lets you show off your unique sunny style from sunrise to sundown.